The casquette or cycling cap – a hangover from bygone days or not? The advent of helmets seemed to kill off the cycling cap, along with the ‘hair net helmet’ (thank goodness). 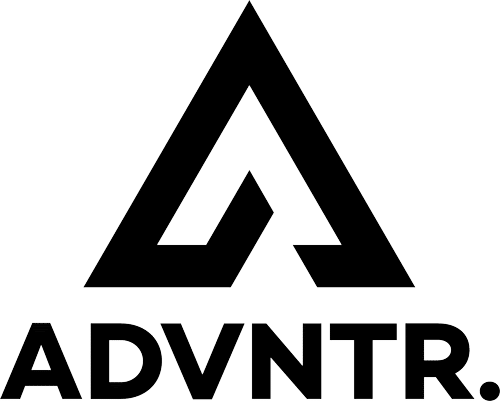 Largely absent for many years, they seem to be making a bit of a comeback. What they are for is a moot point. They can shield your eyes from the sun, or keep the rain from your eyes with the peak down. You can reverse them to protect your neck from the sun (the DeVlaeminck) or you can wear them peak up, for the Roubaix hard man look. Alternatively, they can keep your head warm on those nippy dawn rides. Finally, if you want to be totally hipster, wear one when not riding your bike. In public! No one will ever think you’re a fool. Honest. 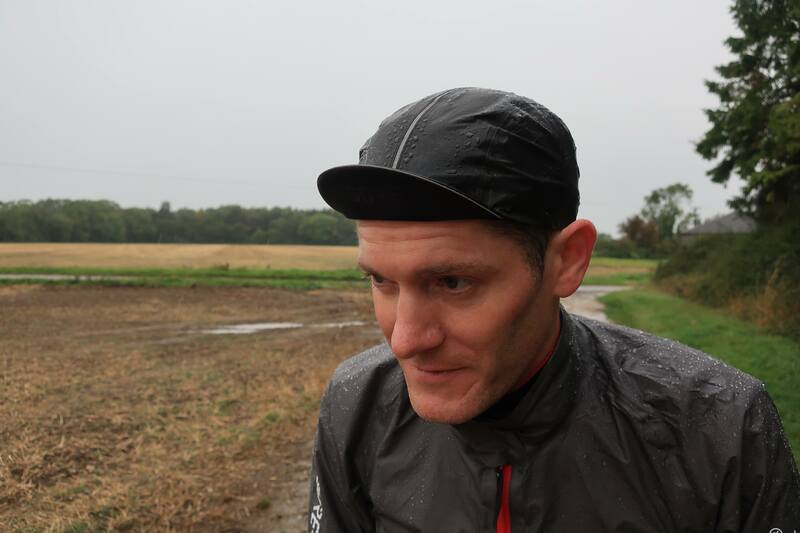 One area where the humble cycling cap has always failed is in wet weather. A few minutes in the rain and you end up with a soggy cloth sat on your bonce. Recently, a few water proof caps have been finding their way onto the market. 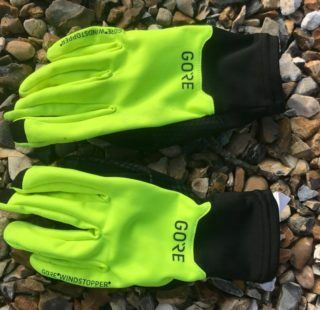 The boffins at Gore Wear have obviously suffered from the dreaded soggy cap syndrome, and decided to do something about it. 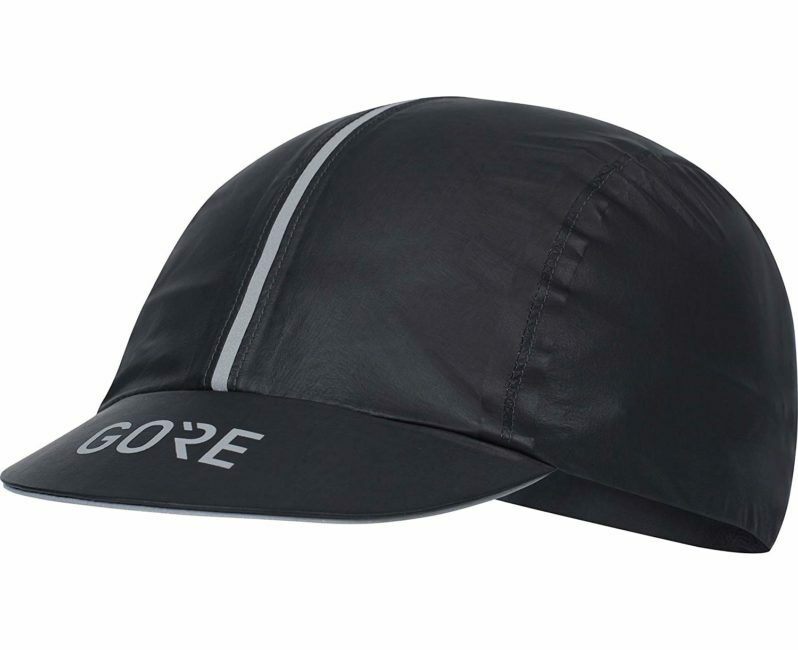 Introducing the Gore C5 Gore Tex Shakedry Cap! Lovely weather for ducks and Gore-Tex clad cyclists. 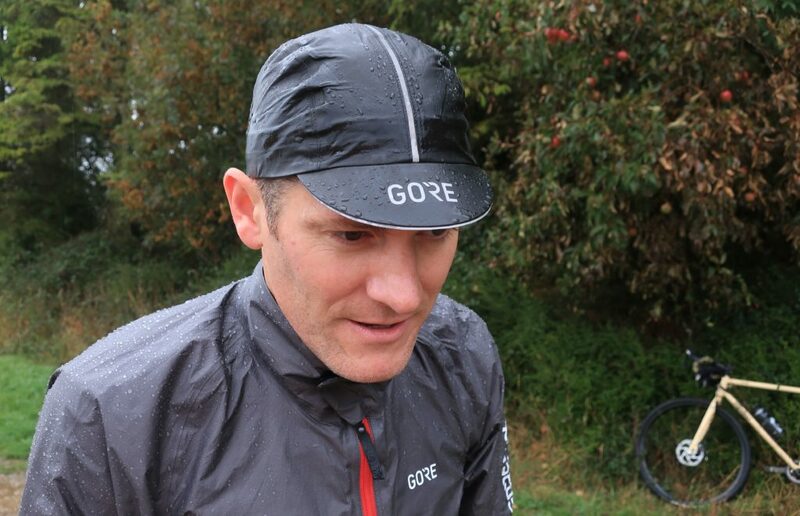 The Gore Shakedry Cap is a traditional road cycling cap in every possible sense but with the added bonus that it offers protection from rain thanks to Gore-Tex fabrics. Unlike many waterproof materials, Gore-Tex is highly breathable so you don’t boil over and sweat out under the cap. 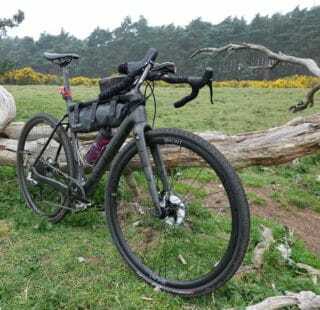 I put this to the test one early morning on a ride that started out wet but which later cleared up to be a fine and sunny day. As the rain passed over, and the heat started to rise, I was happy to leave the cap on. it is debatable whether it performed better than a cotton cap in the dry, but I never got so hot that I wanted to take it off. Worn under a helmet, the reflective detailing is lost. The peak does feature a reflective band however. At only 22 grams, it’s not going to upset even the most obsessive weight weenie and should be an essential item in any bike packers luggage. 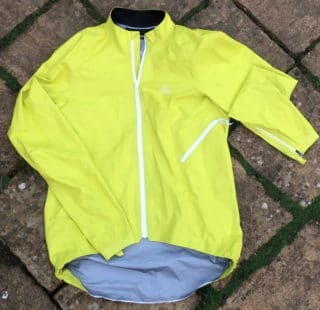 Other than the rigid peak, the cap easily scrunches up into a jersey pocket. My head has remained dry on wet rides and even during a test in the ADVNTR office shower cubicle! 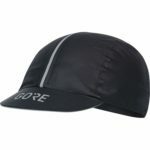 The Gore Shakedry Cap comes in a one size fits all with an elastic back for maximum comfort and fit. Unlike many cotton caps which tend to nip around my temples, this cap was largely invisible during rides. For many the cycling cap is a fashion statement. An opportunity to show a little flash of colour and individuality. So, if you are the kind of rider who likes their cap to be adorned with bright yellow bananas or the logo of a Pro Team long consigned to the history books, the Gore C5 Shakedry Cap may leave you a little disappointed. Cycle peak deployed! Model not amused, but comfortably dry. The cap is charcoal grey and the only highlights are a reflective band over the head and a couple of logos. Worn under a helmet, the reflective detailing is largely unseen other than a thin band around the peak of the cap. At £39.99 the Gore Shakedry Cap is probably one of the most expensive cycling caps out there, but it is worth every penny. All the features you love of the humble cap brought bang up to date with clever Gore-Tex waterproof technology. 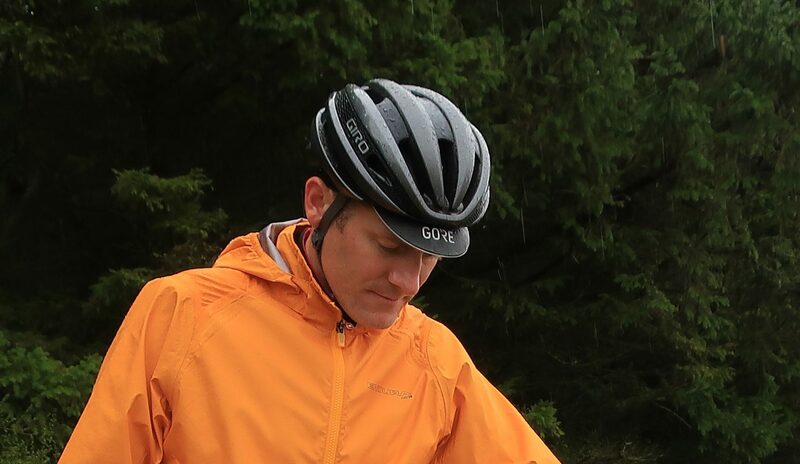 The cap is so practical that you’ll be using it all seasons and on cycling adventures for years to come.